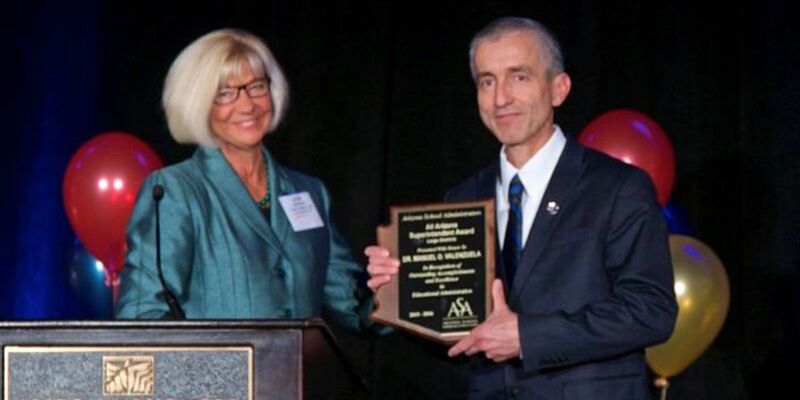 SAHUARITA, AZ (Tucson News Now) - The Arizona School Administrators named Dr. Manuel Valenzuela, the superintendent of the Sahuarita Unified School District since 2010, as their Superintendent of the Year for large districts. "When one thinks of an 'All Arizona Superintendent,' the gold standard of leadership, certain adjectives come to mind, commitment to excellence, innovative, teamwork, visionary, passion, and dedicated. Dr. Valenzuela exemplifies the gold standard and more," SUSD Governing Board member Tom Murphy said in a letter of support. Those who receive this award are administrators "who have shown incredible effort and commitment to enriching the lives of children and the community as a whole," according to a news release. Instructional leadership, financial management, short/long term planning and relationships with the board, public and community are taken into consideration. Valenzuela was the first educator in Arizona to receive the Milken Family Foundation National Educator Award, in 1998; in 2006 he was featured in the American School Board Journal for work in managing topics related to immigration and border issues. Sahuarita School District has also had a Top Ten Finalist for Arizona Teacher of the Year for four years and three Arizona A+ Schools, while Valenzuela has been superintendent. He began his career in education in 1989 as a middle school science teacher in Marana, joining SUSD as an assistant superintendent in July 2005 after nine years as an elementary school principal in the Flowing Wells School District.